At Arosbaya, 11 km from the town of Bangkalan, situated on the edge of a small ravine, is the tomb of Kanjeng Ratu Ibu, wife of Cakraningrat I, and the old royal cemetery of the Cakraningrat dynasty. The complex is located on a hill, about 4 km inland from Arosbaya. The headstone is worthy of inspection, and the view from the cemetery is spectacular. 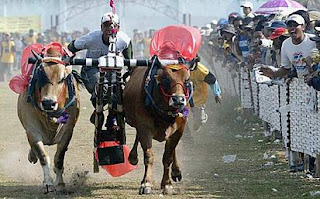 Bull Racing in Madura is a folk sport that come, into existence long, long ago. Though the colour and excitement is different from the familiar sports of Westerners, it is equally interesting and thrilling. Conducted in the rice fields, the past time evolved into an organized sport with adherents not only in Madura, but spreading to nearby East Java as well. Much later, in 1926 the Dutch East Indies government recognizing the positive impact of the sports on efforts to develop animal husbandry in the province, made available an annual subsidy of 10.000 guiders (± $3220) to promote bull racing in Madura. The races in its modern form, play a fundamental part in the life of Madura and its people, bringing activity to a standstill when a race meeting is in progress. Conditions specified that bulls entered for the race must be of Madurese stock and colour, height and strength are also taken into consideration. The race season is set from July through October. The last race of the season selects the overall champion, by a process of district races culminating in the finals held at Pamekasan, the capital of the island. Realising the tremendous value the races have for attracting domestic and foreign tourist, they can also be arranged on request for the tour groups. The races are conducted over rather short courses. 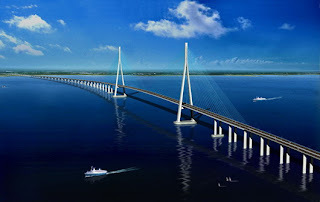 The length of the village race is 110 meters, that of district race 120 meters, and that of the residency races 130 meters. Each course is 30 meters wide. Each race therefore lasts only a few seconds, conducted in a series of elimination heats between winners and losers of preceding heats. Excitement mounts heat after heat and eventually two sets of winners are determined, the best of the losers and the best of the winners. A three man Jury decides the winner on the basis of which teams' legs cross the finish line first, a system which varies absolutely from that of a horse race. Races start at 10.00 am but already in the morning crowds gather along the street leading to the stadium. The bulls adorned with flowers ribbons, Jewelled head-resses and Yokes, parade through the streets of the town, shaded by brightly decorated parasols, accompanied by strolling drums and flute bands, each team followed by is groups of musicians, handlers and supporters. A bull parade and whip mass dances performed by local school children are the pre-race formalities. The bulls are stripped off their fineries which are exchanged for more practical racing gear. The jockey perches on the wooden sled, holding the reins in one hand and a whip or baton to drive the team with the other. A flag is then dropped as signal for the start. However the real show lies not only in the race itsell but also in the festivies which from an integral part of a race gathering. But Madura doesn't only mean bull races. There is more to it for those with time and interest for archaeology and glimpses at the remaining rurall life of olden times. Pamekasan is the capital, of Madura. Five km. south of the village of Dangka, there is an interesting eternal fire, best seen on a moonlight night. The great Kerapan Sapi is held here annually at the beginning of September or October. A showroom for the local arts and crafts is located near the public square. 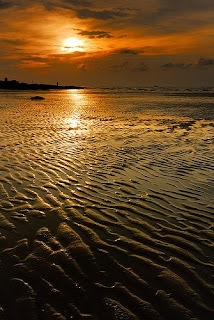 About 21 km from Sumenep, Slopeng Beach is located on the north coast of Madura. The tall palm trees lining the beach's edge provide welcome shade to visitors. 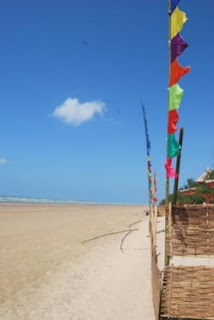 Lombang Beach is located on Madura's north-easternmost point. A row of short pine trees separate land from the stretch of fine, white sand is backed by short cemara trees - an ideal location for visitors in search of quiet relaxation. Passing visitors, feeling somewhat uncomfortable due to the hot weather, will no doubt appreciate a custom in which local villagers offer them fresh, young coconuts, picked straight from the trees. Sumenep, an old and attractive town, 53 km north-east of Pamekasan in the more isolated hills of the interior. See Sumenep's 18th century mosque, the kraton and its small but interesting museum of royal family possesions. Asta Tinggi, the royal cemetery is only about three km from the town centre. Asta Tinggi is the cemetery of the kings of the Sumenep empire The mosque at Asta Tinggi was built during the 17th century and has an entrance gate depicting a mixture of Javanese and Madurese styles. Some 1.5 km from Asta Tinggi is the Royal Palace (Keraton) of Sumenep. 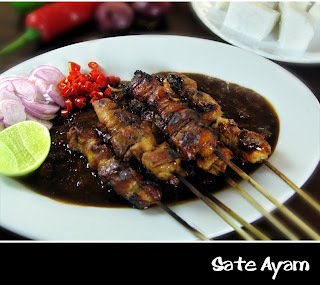 madura memang mantab tuh apalagi dah jadi suramadunya..Hmmm bakal banyak orang wisata ke sana buat ngeliat karpan sapi sama makan sate khas madura..